Pulido beat Alfredo “Al” Amezcua two years ago, in 2010, by just under ten thousand votes. Pulido got 21,588 votes, or 49.5% of the ballots, in 2010, versus 11,689 votes, or 26.8% of the ballots, for Amezcua, according to Smart Voter. There were three other mayoral candidates in 2010 – Alvarado, Collins and Charles Hart. There was quite a stink raised this year about the supposed “Santa Ana Spring.” But in the end the bogus revolution saw several of its candidates lose. 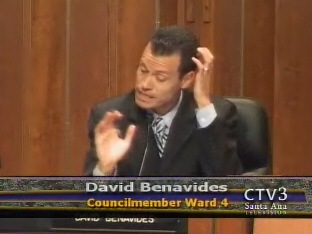 The biggest shocker was the loss by Santa Ana Planning Commissioner Eric Alderete, in Ward 3. Alderete was defeated badly by Angelica Amezcua, a local school teacher who did not spend any money and barely campaigned. I am pretty sure that Alderete would have prevailed had he sided with Pulido but instead he went with Benavides, Amezcua and SAUSD Trustee John Palacio, and he was doomed. Benavides cabal member Santa Ana Council Member Vince Sarmiento barely beat out his own opponent, Estela Amezcua, the sister of Alderete’s opponent. Sarmiento spend over $70K while Amezcua spent nothing. This poor showing by Sarmiento will dash any thoughts he had of running for some other office in two years. SAUSD candidates Valerie Amezcua and Myriam Tinajero were also part of the Santa Ana Spring and they lost too. Amezcua, the daughter of Al Amezcua, got more votes but still lost as she was edged out by incumbent Jose A. Hernandez, who is a Pulido ally. The top vote getter in this race was Republican Ceci Iglesias and she was followed by another Republican, Rob Richardson. It should be noted that Pulido ally Claudia Alvarez also won in her race for the Rancho Santiago Community College Board. She beat out another Benavides ally – Mark McLoughlin. The lesson learned this year? If you stand against Pulido good luck to you – but you will likely lose. you only need to win by one vote. But the fact that Benavides was trounced this badly is one I am most grateful for. One of benavides mistakes (among his many) was the flawed logic that he was going to win this thing via social media. Until you can vote on Facebook, that strategy is a loser. It is apparent that he realizes this: he has not updated his websites in weeks, No “thanks for the support”, no “it was a hard fought battle….”. Another huge factor was the fact that so many of his supporters could not vote, either too young, felons or non-citizens. Just a bad execution period. Proof POSITIVE that Benavide’s and his minions read this blog,Hours after I typed this, he dreams up a “Thank You” message. Too bad he and Lomeli didn’t start reading this blog sooner! they might have done better or set theirs sight more realistically! I ran into Al Amezcua after he lost in 2010 and he said that he should have worked with me instead of the yahoos he ended up campaigning with. Well, I tried to work with him but he ended up siding with the Usual Suspects and that was the end of that. Benavides worked with the same bunch that tanked the Amezcua campaign so it was no surprise to met that he lost big to Pulido. This is the can’t shoot straight squad! What changes do you see on the horizon with the new City Council? The “new” majority has not proposed any changes have they? That’s correct. I expect them to try to convince us to tax ourselves to pay for a raise for the cops.